Shan Hai Lou (山海楼) Restaurant's two branches in Beijing are both set inside parks. Its Chaoyang branch is located next to the east gate of Tuanjiehu Park, and the Jishuitan branch by the beautiful Xihai Lake. While the Chaoyang branch is modern, trendy, and cozy, the Jishuitan branch has a great view of the lake, a garden at the back, and even a room on a boat in the lake. Both are designed and built like luxurious, private clubs. 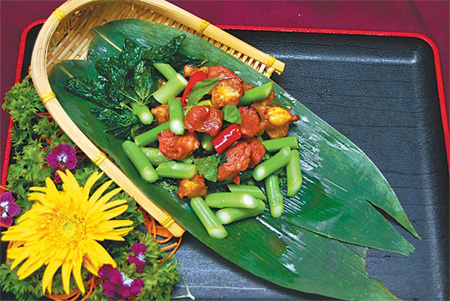 The food is based on Cantonese cuisine, but also draws from Sichuan, Hunan and Western cuisine. According to GM Guo Dongping, the restaurant uses olive oil for all dishes, and picks only the choicest ingredients, with an emphasis on their health benefits. Many dishes on the menu are unique. It's rare to find French goose liver (清汤法国鹅肝) made into clear soup elsewhere. The goose liver is soaked in milk for 10 hours, and in sake for 2 hours, before being stewed and served in clam soup. The goose liver tastes smooth, flavorful, and greaseless. Sea cucumber (香茶活海参) is also made differently here, freshly flavored with green tea and fennel. Bachugu mushroom (茄香巴楚菇), a rare wild variety from Xinjiang, is stewed with bacon and tomato to give it a meaty and appetizing flavor. The restaurant also offers a variety of tasty Cantonese cold appetizers, classic Cantonese specialties such as roast goose or chicken, besides marinated meats, and seafood. Its chefs also cook up a range of healthy soups with herbs, duck, mushroom, and vegetables. The menu has a Chinese part and a Western part, with appetizers, main and dessert sections. Dishes can be served either together or individually. There are set meals from 688-2,980 yuan per person. A la carte bill is more than 580 yuan per person. Reservation is a must.